DIY is headed back to the barn. This week, the network announced they’ve renewed Barnwood Builders for seasons five and six. 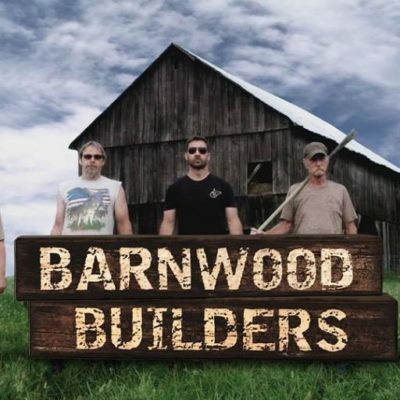 New episodes of Barnwood Builders are slated to premiere later this year. What do you think? Have you seen Barnwood Builders? Are you glad it’s been renewed? More about: Barnwood Builders, Barnwood Builders: canceled or renewed?, DIY TV shows: canceled or renewed? When will the show be back on, we miss it ? Great program Being a WV born and WV/KY raised boy and WVU grad 50 yrs in TX, I enjoy looking at a piece of home and the places that I grew up. My great grandparents, my grandparents, and mother all lived the life in the mountains and wher e I played. They look like unkept hillbillys as is the current trend in tv.I’m watching them stack precut beams on a premade foundation with a crane while listening how difficut it all is. Its not. Am so glad that the series was renewed because besides being good men, they save a lot of old barns, etc. Yes, love the history. Without these guys we will all eventually just live in a paved parking lot. I would love to know why in some of the restored cabins they show the massive chinking exisits? I see some chinking of 12″ thick chinking. Why cant the logs be closer together? Love the show and what they do. It’s beautiful and awesome to see what they do and save. I Love Old Barns and Timber Frames and Craftsmen and History. Barwood Builders Rolls All That into one Show and I just Love these Guys!! So very glad the show was renewed! Why do they always cancel the best shows??? What will they put in its place? A remake of Mork and Mindy!! They put all kinds of junk on for years and years when they get a truly interesting, different show that people love. It’s something the whole family can watch. They take it off the air!! How many years has survivor been on??? Lost interest many years ago! How many bugs can a person eat and still keep an audience interested?? DYI needs to look listen to the viewers!!! Thisis one of the greatest shows on tv. Clean, funny and respects heritage of the early settlers. Awesome show!! Love the show please continue. DIY has found gold with this show.